Fran, my wife of these past eight years and partner of nine more before that, isn’t really much of a cake person. Or a pudding person. Or a chocolate person. We’re quite Jack and Mrs Sprat in our food inclinations. I was a vegetarian or pescetarian for 20 or so years, she’s pretty much always been a keen carnivore. When we got together, our dietary habits met in the middle somewhere, but I still don’t have a great sense of what her favourite cake is. Personally, I’m all about the chocolate, so a rich chocolate cake is what I always hope for on my birthday. As her birthday approached last week, however, I wasn’t sure what do bake her. I hinted for some guidance, but it didn’t really manifest. So I looked through old recipes and took a punt. This isn’t exactly what you’d call a celebration cake. It’s not slathered in icing or exactly suitable for candles. But it’s rich and yummy, and a bit different. 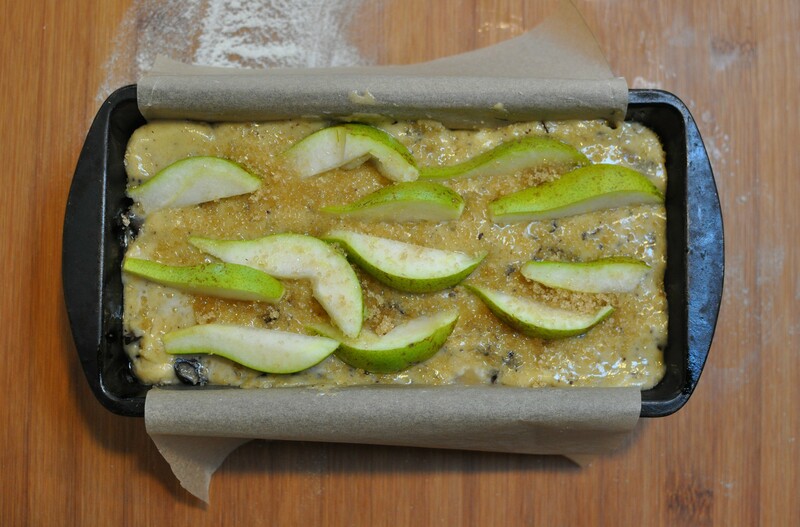 It’s originally from a recipe by Nigel Slater in The Observer. His piece was all about the honey, which is here used to make the citrusy syrup. I enjoy honey, and always like to have a jar of special honey in the house. A few years ago, some friends from New Zealand came for a visit, and brought a jar of Tutaki Manuka honey, produced by Trees and Bees, up the Mangles Valley, in the Buller Gorge, South Island. This was my stomping ground on and off in my youth, so a mere sniff of the jar is hugely evocative. Just as that jar was reaching emptiness, my friend Alex “Kabak” Marcovitch gave me a jar of honey from the bees he’d kept on his allotment in the Coombe, just on the eastern side of Lewes, about half a mile from home. The Coombe is a try chalk valley that cuts into Malling Down, which is a reserve managed by the Sussex Wildlife Trust. It’s farmed to preserve the ancient Downland ecology, an essential task as Britain has lost 97% of its wildflower meadows since the 1930s, when the Second World War food shortages meant vast amounts of grazing land was put under the plough for grain and potatoes. It’s a special place, especially at this time of year when not only are the orchids (common spotted and pyramidal I believe) out, but the wild thyme and wild marjoram are starting to flower. Before moving to Lewes I didn’t even realise these herbs grew wild in Britain. I grew up on the Downs, but at the other end of this ridge of chalk hills, in Winchester, 80 miles to the west. I don’t remember seeing thyme and marjoram growing wild there. Perhaps Sussex is just that bit sunnier and dryer (it has some of the most sun and least precipitation in the UK). Anyway, Alex’s Coombe honey evokes Malling Down with one sniff, the thyme, marjoram and innumerable other flowers the bees visited in their time there. Alex subsequently lost the allotment, so the Coombe honey is extra-special, as it was only produced for one year. The bees are now in his back garden, feeding off more domestic flower species, but apparently doing well. I’ll admit I didn’t use special honey for Fran’s cake. Don’t tell her. I used cheap rubbish, which I buy for making granola. I know, I know, it’s probably made by bees who are fed sugar syrup, but… well, home economics. Plus, I just prefer to keep the good stuff to enjoy simply with a piece of bread or toast; I don’t want to lose its qualities in the melange of cooking. So yes, I’d love to make this cake with special honey, but I defaulted to the cheap stuff. Don’t tell Fran. 1. Grease and line the base of 20cm round, loose-bottomed cake tin. 3. Beat the butter and sugar till light and fluffy. 4. Add the beaten eggs and combine. 5. Add the ground almonds. 6. 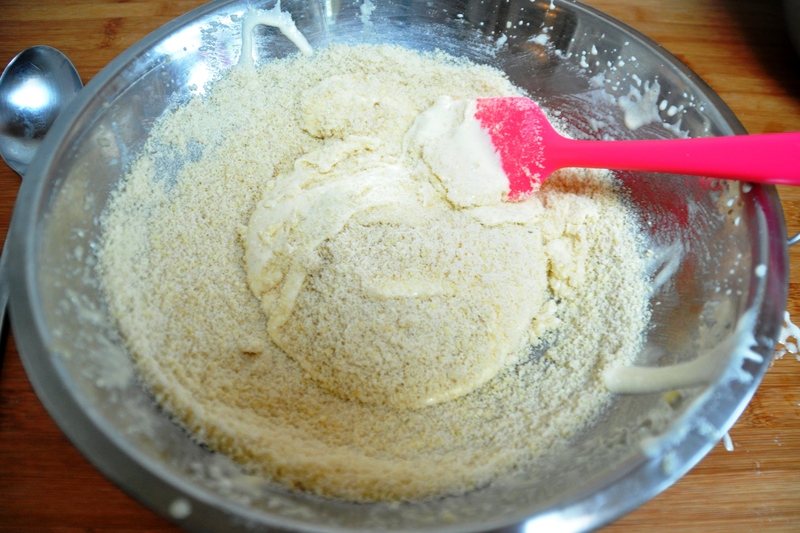 Mix the polenta and baking powder, then fold into the mixture, together with the zest and juice. 7. Crush the cardamom pods and extract the black seeds. Grind them to a fine powder. Add the spice to the cake mixture and combine. 8. Put the cake mixture in the tin. 9. 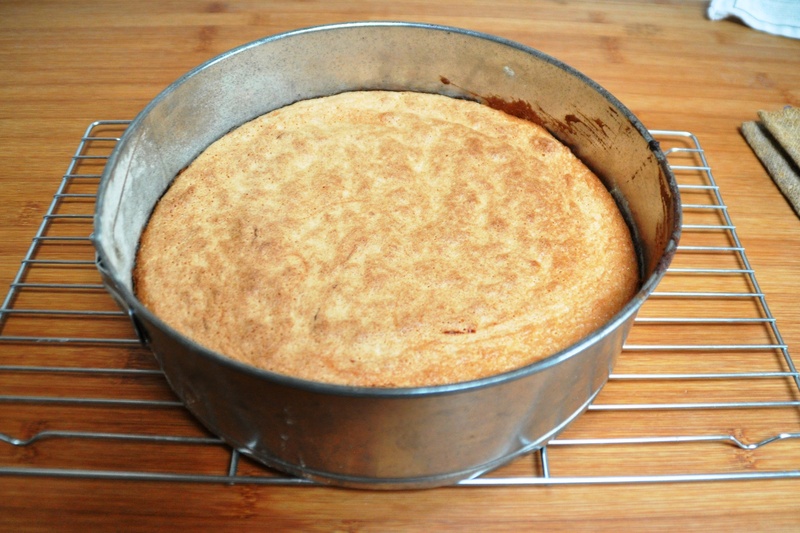 Bake for 30 minutes, turn down the heat to 160C for a further 25 -30 minutes or until the cake is firm. 10. To make the syrup, put the honey and juice sin a stainless steel saucepan, bring to the boil and dissolve in the honey. Keep the liquid simmering until it has formed a thin syrup, about 5-10 minutes. 11. Spike holes into the top of the cake (still warm and in its tin) with a skewer then spoon over the hot citrus syrup. 12. Leave to almost cool, then remove from the tin. Serve with Greek or other thick yogurt, crème fraîche, or even thick cream. It’s up to you. It doesn’t really need the dairy blob though. With its dense, ground-almond texture and dowsing in syrup, it’s not unlike the Greek cake Greek revani or Claudia Roden’s Orange and almond cake, which Rachel Roddy talks about here, or is also available here (scroll down a bit). Yum. T-Rex, three and a half, rejected it on the first bite. The Raver, almost two, went mad for it. Fran seemed content with it too. If you try to eat local and seasonal produce in England, you will have had a lot of brassicas and root vegetables recently. It might be have been dry, warm and sunny the past few weeks, but we’re only just in Spring really. Spring produce – sprouting broccoli, fennel, spring onions, green garlic – has been arriving the past month, but it’s still the tail end of the root veg season, notably that of finger and chopping-board staining, love-hate relationship beetroot. As much as my tastes were in part shaped by old skool school dinners in the 1970s and 80s – oh, the stodgy puddings! – I never really clicked with beetroot. I eat it now and can enjoy it, especially braise-roasted with thyme, bay and citrus zest but frankly, as a cake man and a chocolate lover, I like these. The recipe was originally from Jill Dupleix but is now tweaked somewhat. 2. Peel the beetroot then purée. You can do this in a food processor, though I’ve found the best way to achieve a smooth result is in a liquidiser with some of the oil. 3. Pour the purée into a bowl, then add the eggs, vanilla essence and the rest of the oil. 4. Stir in the sugar and a pinch of salt. 5. Sieve the cocoa, flour and baking powder into a larger mixing bowl. 6. Pour the beetroot mix into the dry mix. 7. Mix until smooth and combined. 8. Divide the mix equally between the muffin cases. 9. Bake for about 25-30 minutes and nicely risen and firm to the touch. * I’ve got an issue with this whole three a day, five a day, ten a day rhetoric. I try to scratch make as much food at home as possible, or at least do things like make fresh pasta sauces. But most Britons don’t, apparently; most of us, and indeed most in western Europe and North American, rely on packaged food, ready meals etc, something I consider almost synonymous with junk food. This article talks about how the “UK eats almost four times as much packaged food as it does fresh produce”. This is quite depressing. You can make excuses about busy modern lifestyles and time poverty, but to me it just represents a massive disconnect between people and real food. Not to mention inconceivably vast, vast amounts of packaging that ends up in landfills, where it’ll lie for thousands of years, a record for alien archaeologists who arrive long after our civilisation has driven itself into unsustainable oblivion. As we’re a family that doesn’t rely on packaged food, I don’t buy into the ten-a-day line. If you live on packaged junk, then maybe the ten a day is aimed at you, to offset the damage done by an estrangement from real food. But if you live on real food, with nutritious wholegrains in real bread for example, I don’t believe you need to sit and assiduously eat ten apples or whatever. It’s taken me a long time to make this cake from Lombardy in northern Italy, whose name roughly means “sandy” – perhaps a reference to both its colour and its texture. I first saved a page out of the Independent newspaper back in 1999, with a recipe from Simon Hopkinson. He explained how he’d first eaten sabbiosa in 1984 but when he’d first tried to make it there had been some confusion about the type of flour used. Via an erroneous translation, he laboured under the impression that the flour was corn starch, or what we know in British English as cornflour. Instead, however, it’s a potato flour. In Italian this is fecola di patate, which is translated on Wordreference as both “potato starch” and “cornstarch”. Given that patate is potato, it’s clearly not corn (ie maize) starch – which in Italian is amido di mais. Furthermore, a lot of the Italian recipes I’ve seen for sabbiosa are simply made with wheat flour. I’ve had Hopkinson’s version filed for 17 years, so I wanted to stick with potato. I’m not going gluten-free or anything, heaven forefend, gluten is such a marvellous, useful protein* when treated right. But during a visit to Roma last week, I saw some fecola di patate in the shop at the Città dell’Altra Economia, which forms part of the Ex-Mattatoio, the handsome, sadly neglected 19th century former slaughterhouse, so I had to get it. In UK health food shops, the equivalent does seem to be called simply potato starch. The other distinctive Italian ingredient I’ve used here is Lievito Pane degli Angeli (“Bread of the Angels leaven”!). This is just a brand of baking powder – a chemical blend of difosfato disodico (disodium diphosphate) and carbonato acido di sodio (sodium bicarbonate), much the same as my UK baking powder. Though the degli Angeli brand has a punch of aromi – flavourings. Rachel, who we saw last week, loves this stuff, and was enthusing about its miraculous qualities, but I find the aromi a bit pungently vanilla, and I’m suspicious whether it’s even real vanilla or some synthetic flavouring. Either way, if you’re using non-flavoured raising agent, you can add say a teaspoon or two (to taste) of real vanilla extract if you like. The cake recipe also contains booze, which is similarly optional. Also optional is a mascarpone crema, made with raw eggs, much like that used in many tiramisu recipes. If you’re scared of raw egg, serve with cream, custard or even crème fraîche. Or nothing, for a weary nod towards tedious New Year dietary abstention. 2. Grease and line the base of a 25cm tin. 3. Beat together the butter and sugar until light and very fluffy. 4. Combine the beaten egg with the brandy (if using). 5. Beat the egg into the creamed mixture, adding a little of the potato starch if it starts to curdle. 6. When the egg is all combined with the creamed mixture, sieve in the potato starch and baking powder, and add the pinch of salt. 7. Fold the fecola through the batter until well combined. 8. Pour the mixture into the prepared tin. 9. Put in the oven and bake for about 45 minutes then, carefully, check the cake to see if the top is browning. If it is, cover with foil, then return to the oven. 10. Continue baking for until a skewer comes out clean, for another half hour or thereabouts. 11. Leave to cool in the tin then turn out onto a rack and cool completely. 12. Prepare the accompanying cream. 2. Beat the yolks with the sugar until pale and creamy. 4. In another bowl, whisk the egg whites to stiff peaks. 5. 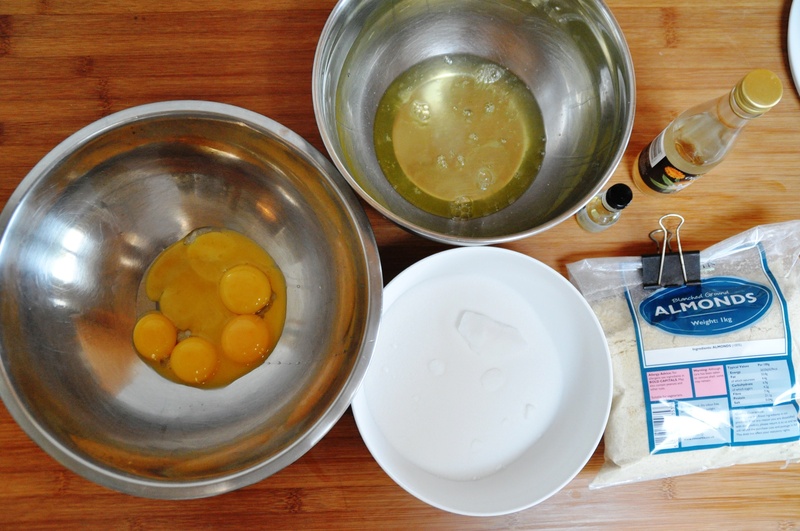 Fold in the egg whites until you have a smooth mixture. 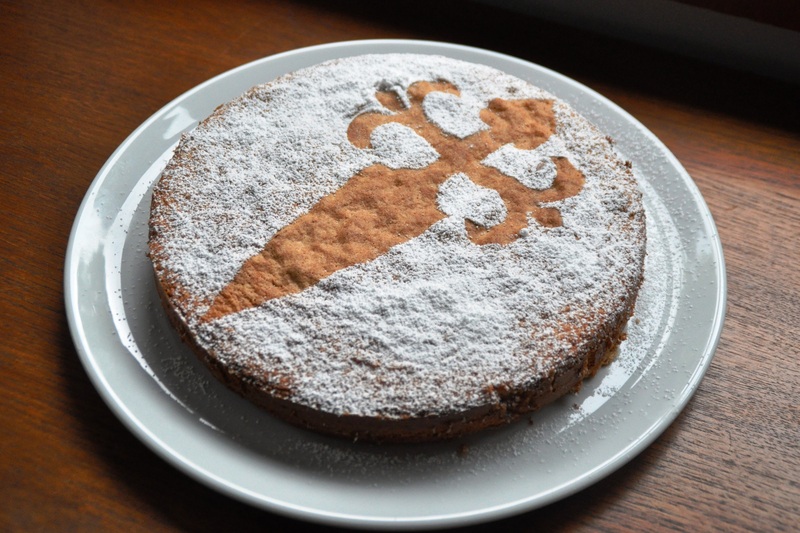 Dust the cake with icing sugar and serve slices with a good pour of the crema. Muse about the potatoes. Ignore new year diets. * Or more accurately, combination of proteins: gliadin and glutenin. Pangiallo is a cake I encountered in Rome, and indeed one of the last posts I wrote before leaving there in October 2013 mentioned it. But I’ve only recently started to make it, and discovered a quite a lot variation in recipes. Which might seem quite surprising, until you consider it’s a cake that purportedly has roots in Ancient Rome. Pangiallo, or pancialle, is a Roman, or Lazio, cousin to panforte, “hard bread”, the better-known dense fruit and nut cake of Sienna, and panpepato (“pepper bread”). All three can be arguably be classified as “primitive cakes”. It’s easy to imagine the first cakes were compressed discs of nuts, seeds and dried fruit bound and sweetened with honey. although food historians suggest pangiallo’s origins are ancient Roman, and panforte is comparatively recent, possibly from the 13th century, people have probably been making these kinds of things for millennia. There’s debate about what spices the ancient Romans had, but they almost certainly used cardamom, cloves, coriander, black pepper, ginger and nutmeg, and possibly cinnamon too. Such spices, many of which arrived in Europe via the Silk Road, maintained a role as important for feast day foods through the “Dark” and Middle Ages. As they had travelled so far they were expensive, so were used only for special foods on special days. Britain, of course, has a very similar tradition of rich, spiced fruit cakes for midwinter celebrations in the form of our Christmas cake and Christmas pudding. Their characteristics have similarly ancient origins, though spices were even more scarce and valuable in northern Europe, compared to Italy. Ports such as Genoa and notably Venice were the western extremes of the maritime Silk Route, the dropping-off points for such valuable cargo; spices still had a long way to go before they reached Britain. Today, Pangiallo is eaten to celebrate the feast day of Santa Lucia, St Lucy, and also for Christmas. Both of these Christian feasts are associated with older winter solstice celebrations. The ancient Romans had Saturnalia, when the ancestor of pangiallo may well have been eaten. 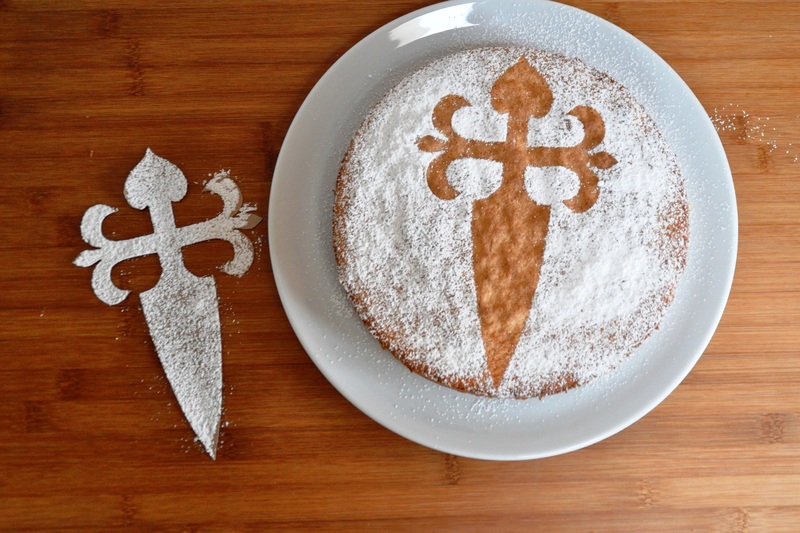 When Rome took Christianity as its official religion, many of the pagan festivals were Christianised too, and the consumption of special spiced cakes continued. The calendar change of 1582 has confused things somewhat as St Lucy’s Day is now celebrated on 13 December in the Gregorian calendar, with Christmas Day closer to the solstice of 21-22 December. In the earlier, Julian calendar, however, St Lucy’s Day would have been closer to the solstice, the day when the night is at its longest. To dispel the darkness, it’s a festival of light, and indeed the very names Lucy and Lucia derive from lux, lucis, the Latin for light. One Roman blogger suggests the yellow, saffron-tinted glaze of pangiallo is symbolic, looking forward to the new light of spring. The only problem with this theory is that pangiallo doesn’t always feature a yellow glaze. Many versions don’t seem yellow at all, but instead more brown from the dried fruits, caramelised sugar and honey, and even cocoa and chocolate. At the weekend I made the version in Rachel’s book Five Quarter’s: Recipes and Notes from a Kitchen in Rome. It’s closer to the version by the blogger mentioned above and does feature a rich glaze, coloured with saffron and egg yolks. Although they all contain flour, Rachel’s version is not leavened, with yeast or chemicals. So I was intrigued when I read the recipe in Oretta Zanini de Vita’s The Food of Rome and Lazio. Hers features a yeasted bread dough. That said, the dough only forms about 20 per cent of the total mass: which is predominantly raisins. Her original recipe is huge, with “1.8kg (about 4lb) zibibbo (seed raisins)”, with the whole formed into a loaf and proved for 12 hours. For my testing process, I can’t really do such enormous bakes, so I halved the recipe and tweaked it. Hers included pine nuts too, for example; I love them, but they’re so expensive and the ones in the shops here have all travelled from China, which seems crazy. I’ve also favoured the disc-shaped form. Half quantities still produced four cakes, each scaled with 400g of dough. So I’ve halved it again here. 2. 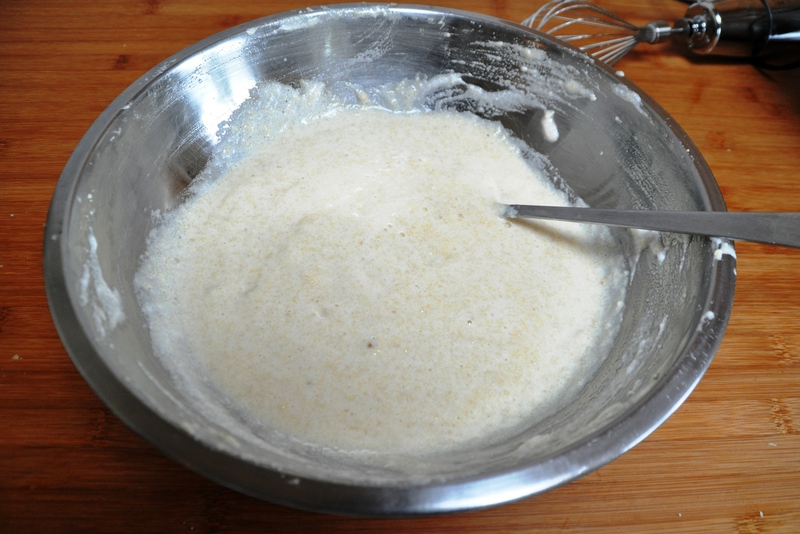 Make a preferment with some of this sugar-water, the yeast and about 25g of the flour. 3. Leave to get bubbly. 4. Put the rest of the flour in a roomy bowl. 5. Add the preferment, the rest of the sugar water, the olive oil and salt. 6. 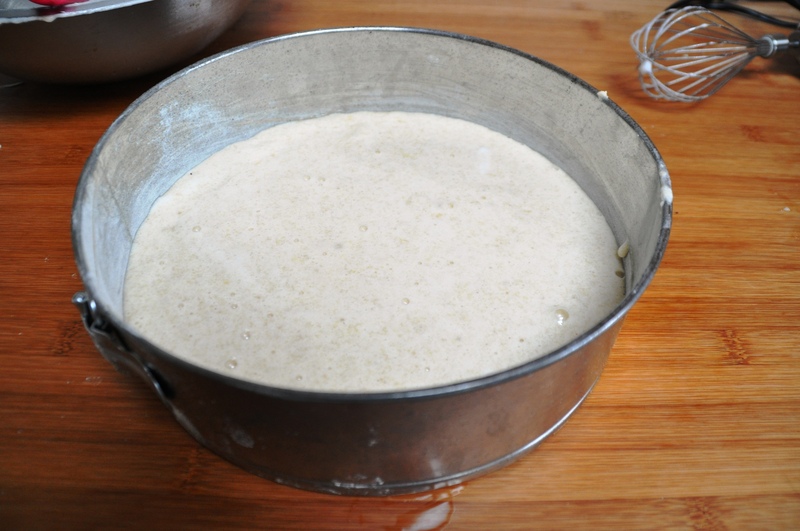 Form a dough, adding more water if necessary, then turn out onto a lightly oiled surface and knead until smooth. 7. Rest 10 minutes, then add the spices, nuts, raisins and peel. 8. Combine. I can’t really say “knead” as it’s all fruit and nuts. It’s more a case of getting your hands in there and squishing it all together. 9. Cover and rest again, for about 6 hours. 10. Form the desire shapes. I recommend a couple of equal balls. 11. Put the balls onto baking sheets lined with parchment or silicone, and squash them down into discs, about 25mm high. If it’s too sticky, flour your hands a bit as you form the discs. 12. Cover and leave again, for about 4-6 hours. Less if it’s warm, more if it’s cold. 13. Heat the oven to 180C . 14. 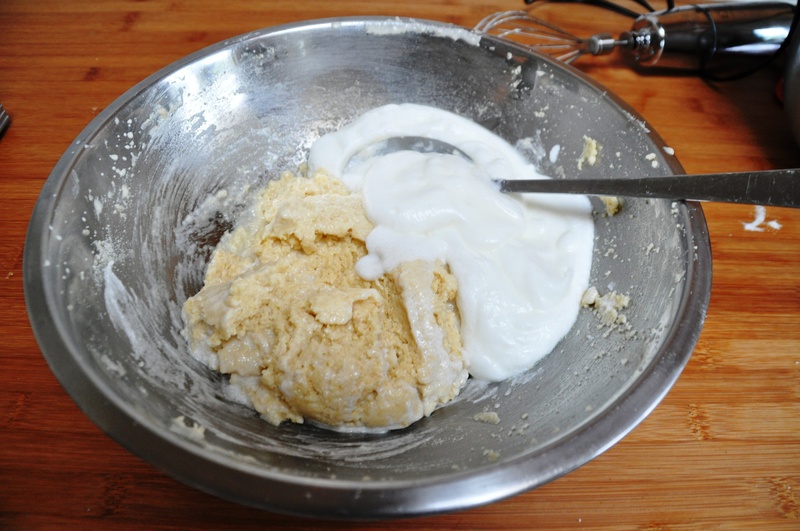 Make a batter with 15g flour, 15g water, 15g oil and 15g sugar. De Vita’s glaze wasn’t coloured yellow, but if you want to, you can add some saffron to the (warm) water and leave it to infuse for half an hour or so. Or cheat and sprinkle in a little turmeric, a spice that’s only mildly flavoured and is more used for colouring. 15. Brush the glaze onto the loaves. 16. Bake for about 30 minutes, until coloured, but without burning too many raisins. 17. Allow to firm up on the trays for 20 minutes or so, then transfer to wire racks to cool completely. 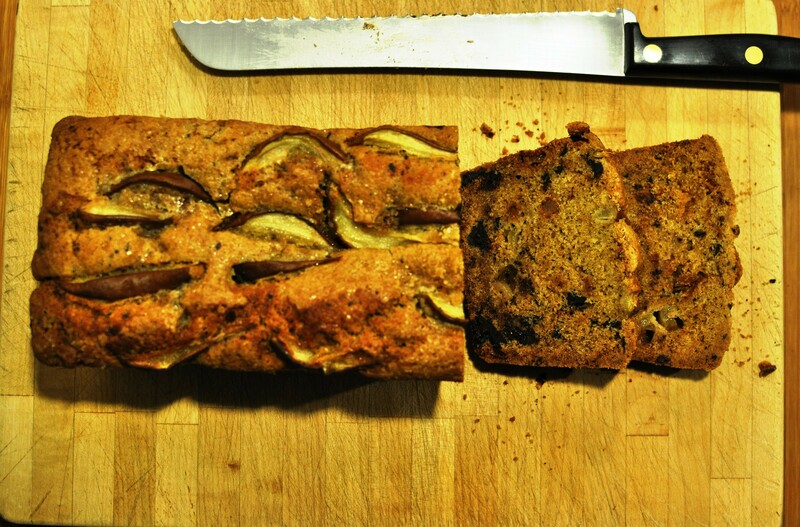 Considering pangiallo is defined by spices, raisins, figs and nuts, the two recipes I tried this week are remarkably different. De Vita sweetens hers only with the fruit and some sugar. Rachel’s uses honey. I’m struggling a bit at the moment as I keep wondering about vegan stuff for my stall, and honey is a ahem sticking point. Many vegans are staunchly anti-honey. I love the stuff, and beekeeping friends have explained to me it’s a more symbiotic relationship with the bees, not the wholly exploitative one Donald Watson suggested in his 1944 edicts on the founding of the Vegan Society. Anyway, Rachel’s (on the left in pic above), which uses mixed nuts and more candied peel alongside the honey, has a more pleasing texture. She describes it as like a “soft, chewy, heavily spiced nougat with a whisper of cake”. Which is spot on. De Vita’s, on the other hand, is surprisingly bready, considering the yeasted dough forms such a small proportion of the whole. It’s like a dense, more traditional, fruit cake, even one we’d recognise here in Britain. It’s good, but not as good. So I’m going with honey, more peel, more varied nuts. No yeast. And possibly even egg yolks in the glaze. Though whether it really needs to be quite so yellow is something I’m still undecided about. I need another research trip to Rome! Parkin is one of those quintessential historic British cakes. Specifically northern English, as it’s most associated with Yorkshire and Lancashire. 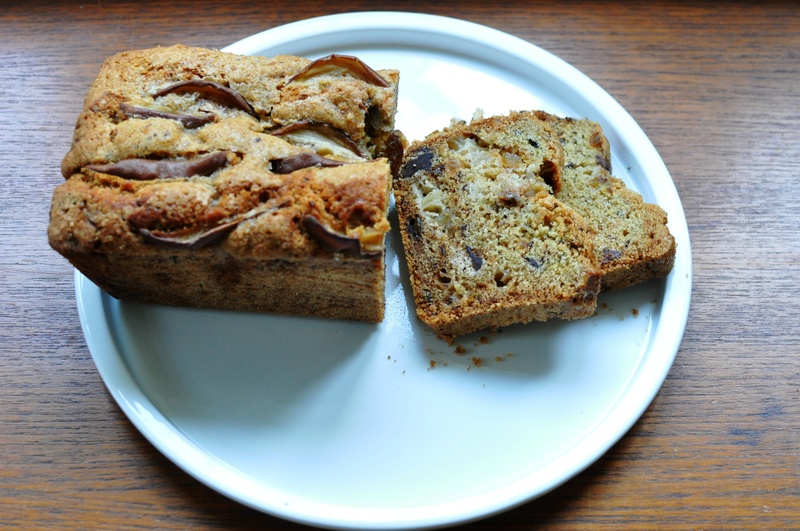 It’s related to ginger cake, in that it usually contains some ground ginger and cinnamon, popular but expensive spices for much of British history, often reserved for Autumn and winter cakes made for feast days. 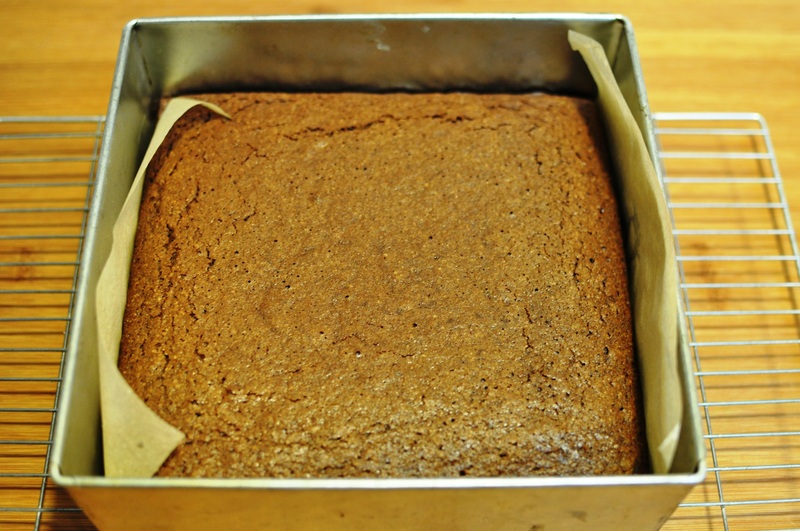 Parkin is also associated with Bonfire Night, Guy Fawkes, 5 November. Yes, I realise Halloween has come and gone and I didn’t post anything, but on that count I would say that firstly, when I was a kid, Bonfire was always a much bigger event in England, and it still is here in Lewes, “Bonfire Capital of the World”, and, secondly, I did make a lot of stuff over Halloween weekend, but none of it was exactly suitable for publication. I had my first go an Mexican pan de muerto (“bread of the dead”) and while it all looked relatively OK going into the oven, when it came out the skull and crossbones decorations had slipped and it looked more like pan de tortuga, er, tortoise bread. So I’ll be practising that more for next Halloween. Anyway, back to parkin and Bonfire Night. 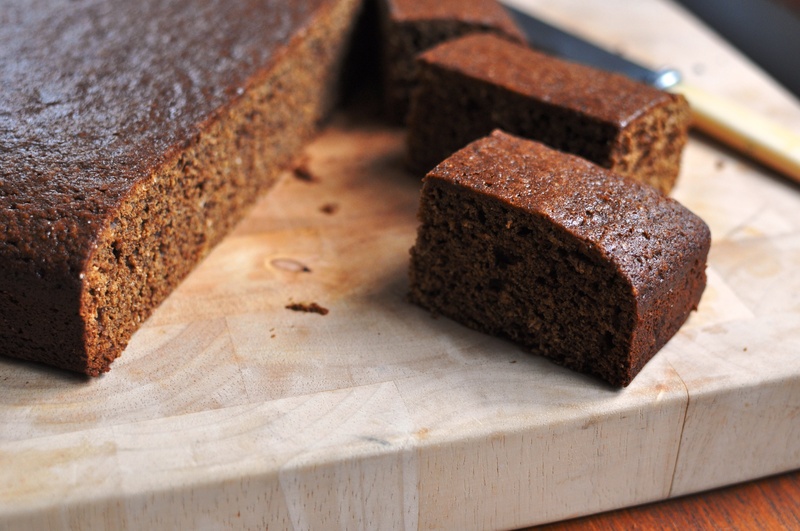 Unlike classic ginger cakes, parkin is made with oatmeal, or a mix of oatmeal and wheat flour. For centuries in Britain, oats and barley were staples of the poor, over the more expensive wheat, and this cake is a record of that legacy. This is another one of those recipes where I can’t remember the source, beyond it being something I wrote down in a notepad while living at Old Man Mountain in New Zealand, this time during a 1997 visit. It’s pretty similar to other recipes you may encounter, such as this one from Dan Lepard in the Guardian, which he reports dates from 1907, this one on the BBC site, and this one at Deliaonline. I’d ignore this one on the Beeb though, as there’s no sign of oats – very inauthentic! Talking of authenticity, older recipes would also have been made with lard instead of butter, though lard isn’t that popular these days, so it’s up to you really. Reading the moaning and trolling on the BBC site, some find eggs contentious too, but hey, there’s only so far you’ll want to go to recreate that 18th century peasant experience right? 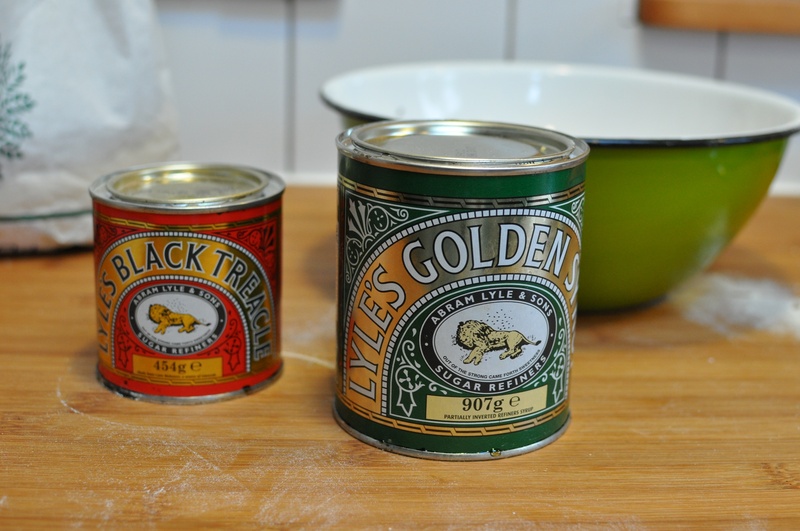 Oh, and if you’re in a part of the world where you can’t get golden syrup or treacle, you could try substituting honey for the former and the latter is just a type of molasses. Ideally, this is made at least a day in advance. Parkin has a pretty dry crumb but becomes moister over time. Happy Bonfire! I’ll be enjoying this with some Harveys Bonfire Boy ale. 1. 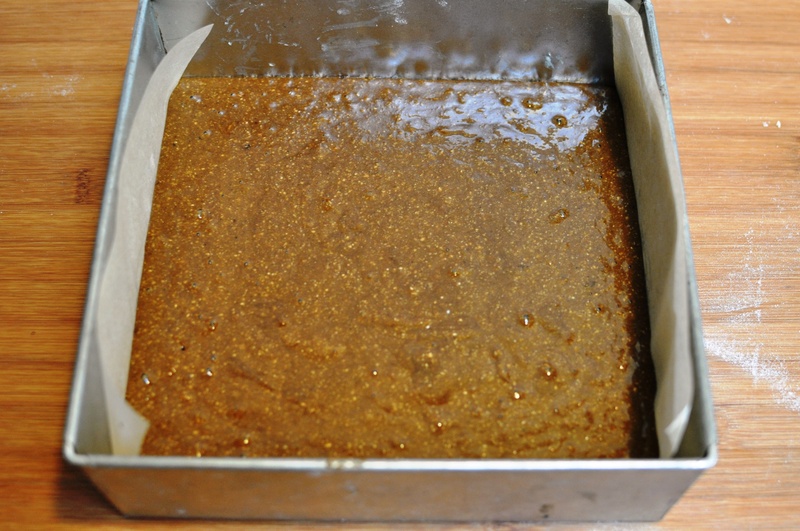 Grease and line a square tin, 20 or 23cm square (8-9 inch) or similar. 2. Heat oven to 160C. 3. 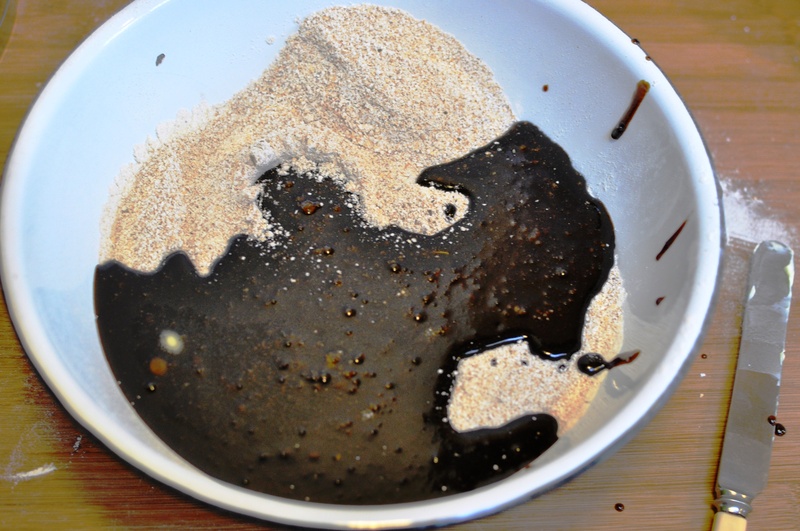 Sift together the flour and spices into a bowl and toss in the oatmeal. 4. Melt together the fat, sugar, syrup and treacle. 5. Add buttery mix to dry mix then beat in egg and milk. 6. Pour the batter into the tin and bake for about an hour or more, until firm and a skewer comes out clean. Cover with foil if top browning too much. 8. Store in an airtight container for 1 day before cutting and serving. Last year, while we were making a lot of changes to our house and garden, I planted some fruit trees. One was a pear, a skinny little thing barely and metre and a half tall. Remarkably, this year it bore a good couple of dozen fruit. So many, in fact, a few branches broke from the weight. I probably should have shaken some off in June. Those from the broken branch, small and unripe, were poached in a red wine concoction back in August. Now, the rest have ripened and been picked. The variety is Concorde, which the RHS describes as a “fine, compact dessert pear” and they’re very pleasant eaten straight. But browsing the Honey & Co Baking Book by Sarit Packer and Itamar Srulovich, I came across a pear cake so it seemed a perfect opportunity to bake with some of my harvest. I’ve tweaked the recipe a bit, and added some chocolate chips, as I had some dark chocolate in a jar that I’d already cut into rough chunks. Pear and ginger is a great pairing. So is pear and dark chocolate. So is dark chocolate and ginger. So why not all three? 2. Grease and line a 1kg loaf tin with baking paper. 3. Peel, core and dice (about 8mm pieces) the two pears. Ideally they should be firm, but ripe. 4. 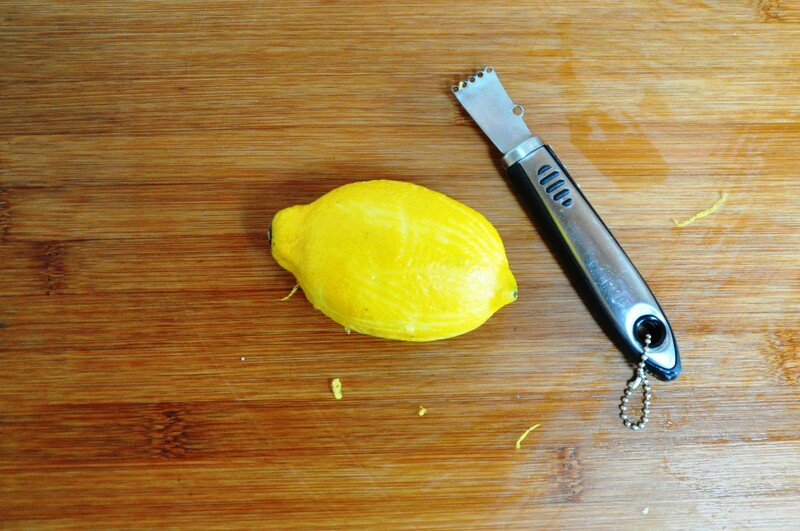 Put the pieces in a bowl and add the lemon juice and zest, stirring it about to coat – this helps to stop the fruit browning while you make the batter. 5. 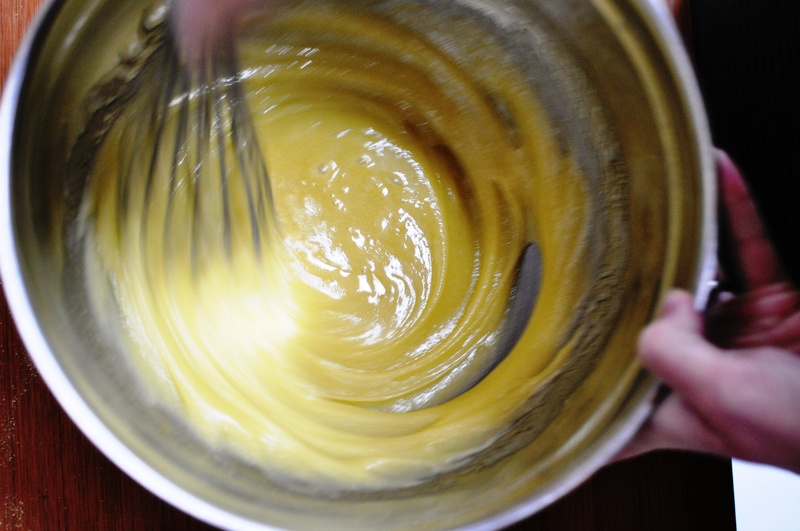 In a large mixing bowl, whisk together the sugar and oil. 6. 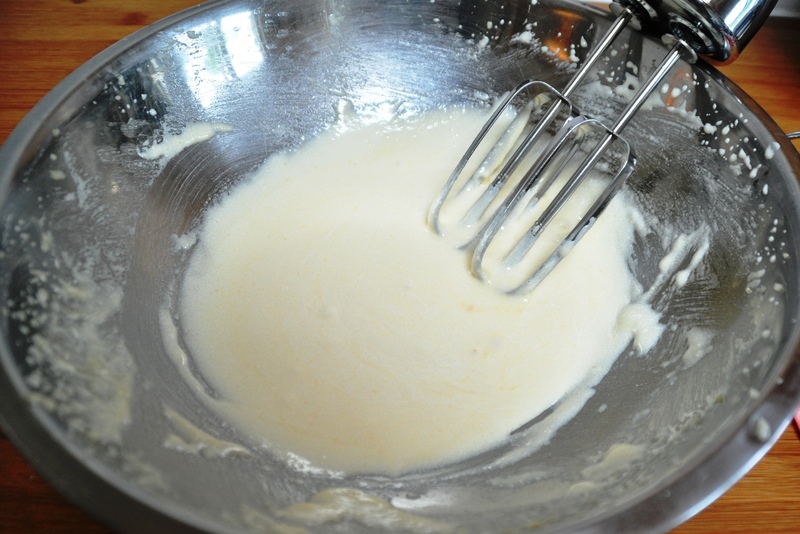 Add the egg and whisk until you have a thick mixture. 7. Add the diced pear and lemon, crystallised ginger and dark chocolate chunks. Stir to combine. 7. 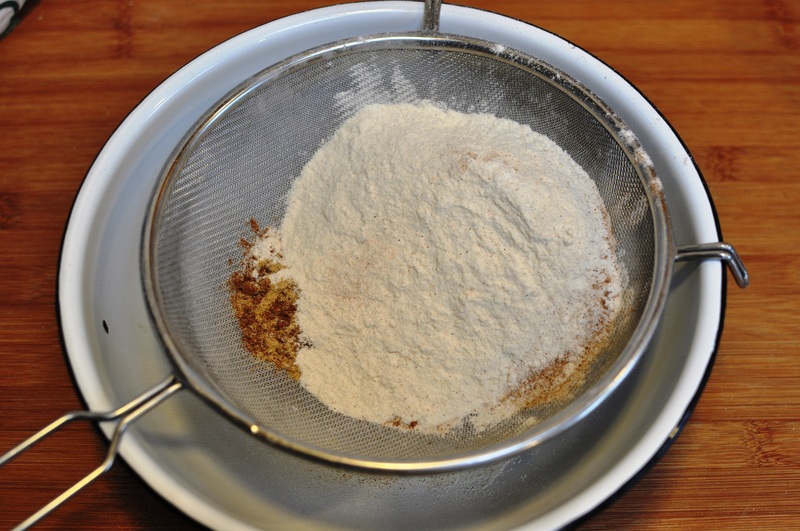 Sieve together the flour, ginger and raising agents then add this to the mixture, along with the pinch of salt. 9. Pour the batter into the prepared tin and, with a damp knuckled, smooth the top. 10. 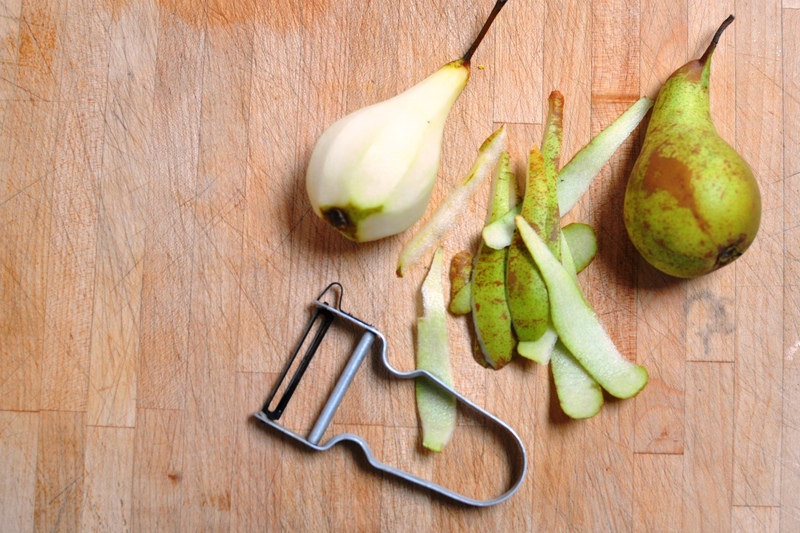 Cut the final pear into wedges, arrange these on top, and sprinkle with Demerara sugar. 11. Put in the oven and bake for about 45 minutes. It’s a moist, fruity cake, and will take a long time to cook, but so you don’t burn the top, take it out, cover with foil, then return to the oven for about half an hour. 12. Insert a skewer to check if it’s done: does it still have damp batter on it? If so, return to the oven for a bit longer. 13. When fully baked, cool in the tin. You can have it as a dessert, while still warm, with a blob of some indulgent dairy product (vanilla ice cream, clotted cream, double cream). Or cool fully and enjoy for breakfast or afternoon tea.